Marlina, Marlina (2005) Perbandingan regulasi emosi pada remaja pria dan wanita. Skripsi thesis, universitas Tarumanagara. "Emotion regulation needed when people enter adolescent period. Emotion regulation usefull for understand and cover emotional condition, especially adolescent's emotion is unstable. Emotion expression between adolescents both men and women is differences. Women preferred express their non-verbal emotion. On the other hand, men do not like to express their non-verbal emotion. So that, emotion regulation between men and women is difference. 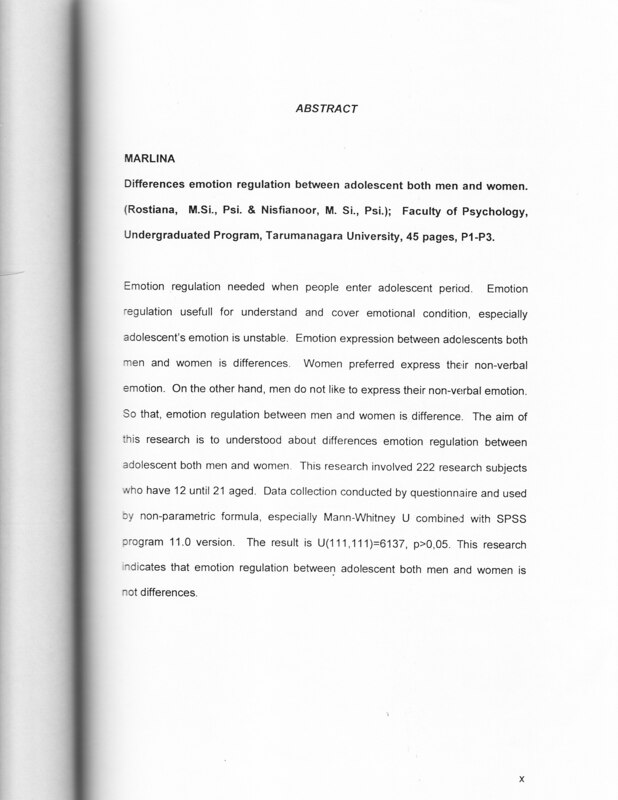 The aim of this research is to understood about differences emotion regulation between adolescent both men and women. This research involved 222 research subjects who have 12 until 21 aged. Data collection conducted by questionnaire and used by non-parametric formula, especially Mann-Whitney U combined with SPSS program 11.0 version. The result is U(111,111)=6137, p>0,05. This research indicates that emotion regulation between adolescent both men and women is not differences. "